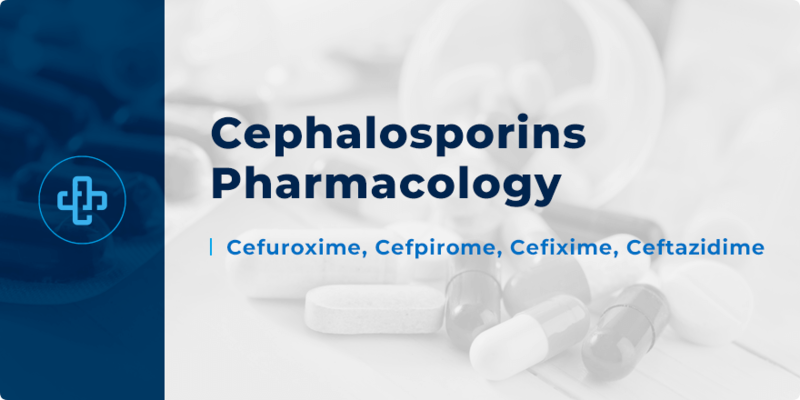 Cephalosporins are one of the most popular antibacterial drug classes. They are also among the most feared – not least due to their many members, generations and indications. Cephalosporins have a long history. They’ve been around since 1945, first isolated from the fungus Cephalosporium acremonium – a fungus found in the sewers of Sardinia. Cephalosporins have since mushroomed into five generations, each of which filled with their own spread of medicines. 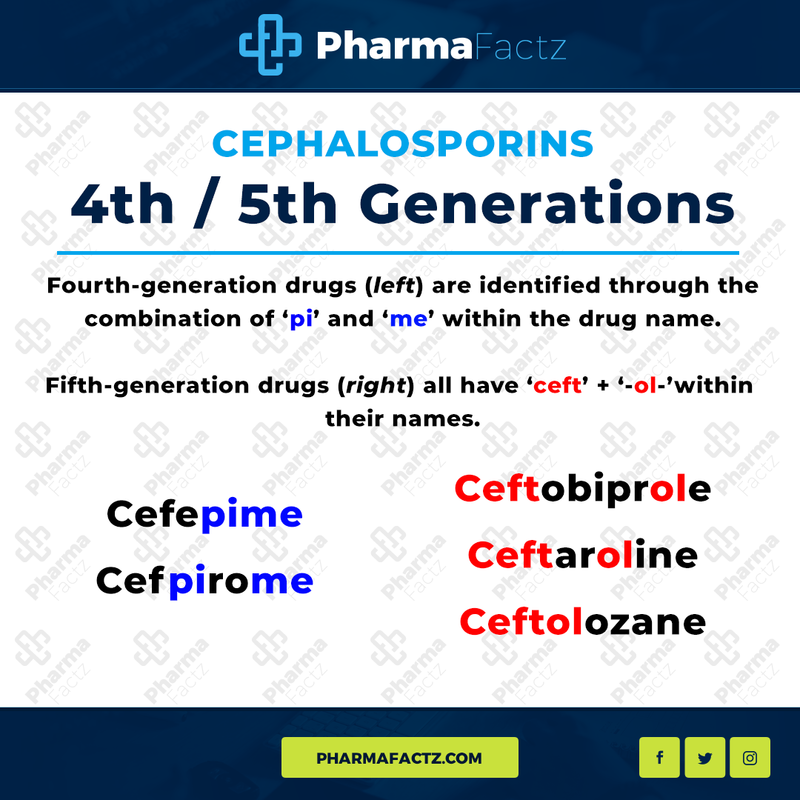 Is it relevant, though, to know which cephalosporin belongs to which generation? Each generation of cephalosporins tells you something about their spectrum of activity. For example – earlier cephalosporin generations have greater activity against Gram-positive organisms, mid-generation cephalosporins have a broader range of activity, whereas later generation agents have extended-spectrum activity. We’ll review much of this activity soon as we progress through each generation. Because there are well over thirty popular cephalosporins, it would be impractical to walk through each drug – listing their own set of indications. However, there are broad conclusions we can draw depending on what generation the drug belongs to. Orally administered cephalosporins are second and third-line in the treatment of respiratory and urinary tract infections. Intravenously administered cephalosporins are used in the treatment of more severe infections – including antibiotic-resistant infections. Earlier cephalosporin generations – such as the first-generation – have greater activity against Gram-positive organisms. Their Gram-negative activity can be summarised through the mnemonic PEcK – Proteus mirabilis, some E. coli and Klebsiella pneumoniae. As cephalosporin generations progress, they become more and more active against Gram-negative organisms. Second-generation agents have less activity against Gram-positive organisms compared to their first-generation counterparts. However, they have greater Gram-negative activity – extending to HEN: Haemophilus influenza, Enterobacter and some Neisseria (in addition to activity against PEcK). Third-generation agents can penetrate the central nervous system, making them effective against meningitis caused by a variety of organisms. Fourth-generation cephalosporins – such as cefepime – are extended-spectrum agents with similar Gram-positive activity as first-generation cephalosporins. They also possess greater resistance to beta-lactamases than third-generation drugs. Both fourth and fifth generation agents are active against Pseudomonas aeruginosa except the fifth-generation drug, ceftaroline. Fifth-generation cephalosporins are active against MRSA. From an administrative perspective, there is less oral administration and greater parenteral administration as generations progress from first to fifth. 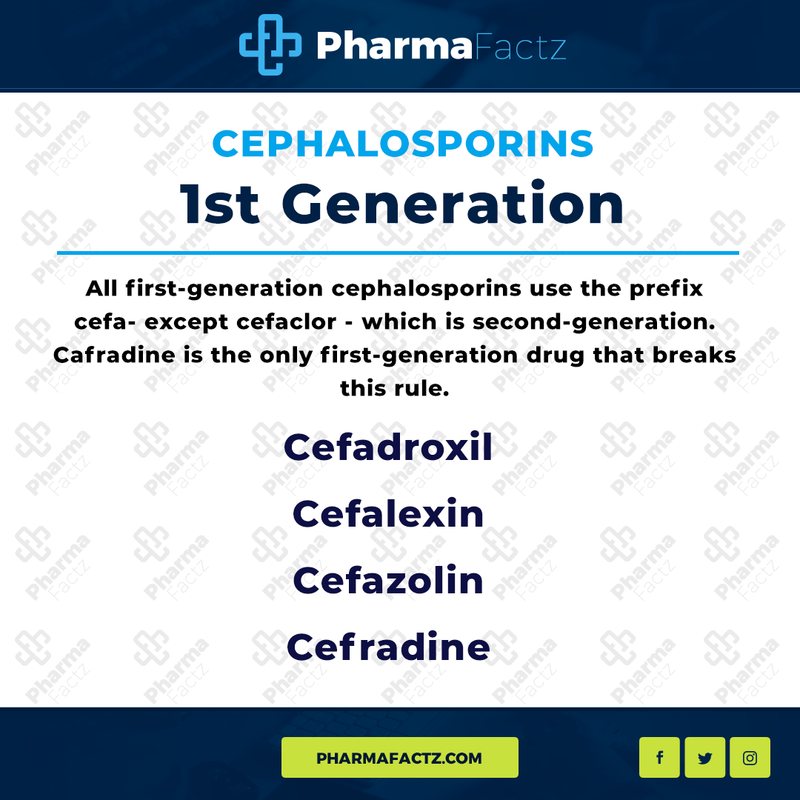 By recalling these more general statements about their indications, clinical facts about individual cephalosporins become that much easier to recall. Later, we review some great pharmacology mnemonics to help you recall members of each generation. First though, let’s take a few minutes to learn how cephalosporins exert their therapeutic impact. Cephalosporins pharmacology is like that found with other beta-lactam antibacterials. The central purpose of cephalosporins is to target the integrity of the bacterial cell wall. By disrupting cell wall synthesis, cephalosporins also disrupt the osmotic gradient necessary to retain structural integrity of the microbe. As the osmotic gradient goes into decline, the microbe begins to swell and, in the end, burst (or lyse). More specifically, cephalosporins work by inhibiting the enzymes needed for peptidoglycan cross-linking in the bacterial cell wall. The final step of peptidoglycan synthesis involves cross-linking at the D-Ala-D-Ala site. Cephalosporins mirror this site – forbidding penicillin-binding proteins (PBPs) from binding to the D-Ala-D-Ala site. 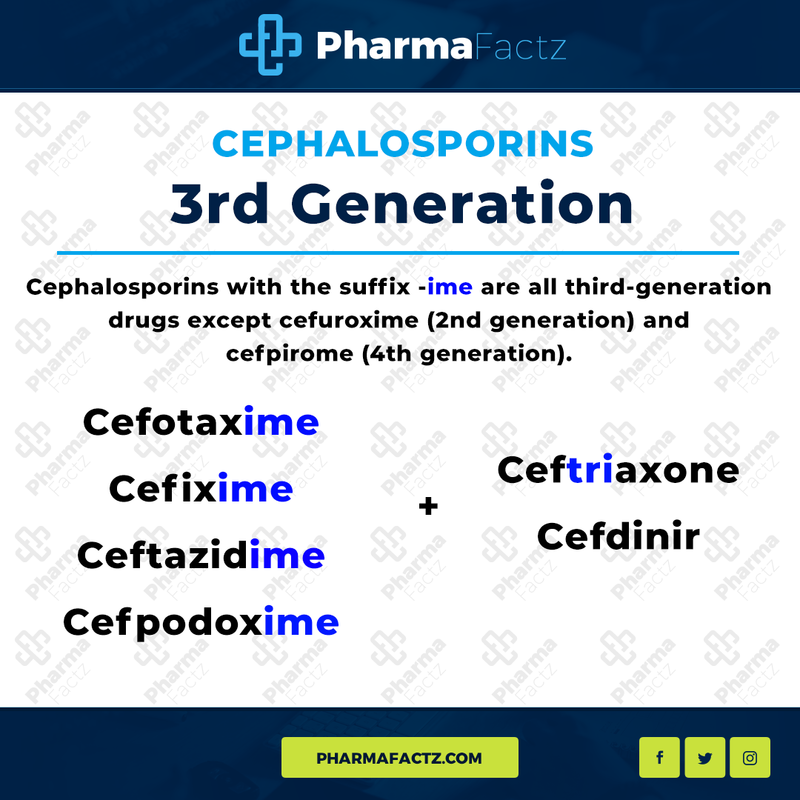 With these indications and this mechanism in mind, let’s learn some great ways you can commit individual cephalosporin members, and their respective generation, to memory. Gastrointestinal effects – nausea, rash, abdominal pain, diarrhea etc. Injectable cephalosporins – pain and inflammation at injection site. Drugs with a broader spectrum of activity can vaporise colonic gut flora; an effect which can lead to the formation of Clostridium difficile-colitis. In rare cases, this form of colitis can lead to perforation of the intestinal wall and subsequent death of the patient. Cross-reactivity with penicillins is also a risk, though much lower than previously thought. That resistance to cephalosporins is rising steadily; resistance becoming more common with second and third-generation drugs. Fourth generation agents exhibit greater resistance to beta lactamases. That cephalosporin use should be used with caution in patients with Clostridium difficile colitis – a risk higher in hospital patients and the elderly. That cephalosporins are contraindicated in patients who have experienced anaphylaxis after taking a penicillin, cephalosporin or carbapenem. That patients with renal dysfunction should be prescribed a lower dose. That ceftolozane is used to treat complicated infections – such as complicated UTIs and intraabdominal infections. Due to multi-drug resistance, ceftolozane is typically administered alongside the beta-lactamase inhibitor tazobactam. Because healthy gut flora synthesises vitamin K (antagonist to the effects of warfarin), broad-spectrum cephalosporins that kill colonic gut flora enhance the anticoagulant impact of warfarin. Learning the pharmacology of cephalosporins doesn’t need to be difficult. First, learn the general indications rules we discussed at the beginning of this article. From there, become familiar with members of each cephalosporin generation – then linking these members to the general indication rules. From there, you can build and branch your knowledge of cephalosporins further with more specific exceptions and caveats. With this solid approach, you’re guaranteed to ace your next antimicrobial pharmacology exam! Want to test your knowledge of cephalosporins pharmacology? Register with PharmaFactz today to receive instant access to all the resources you need. In the meantime, take a few moments to join our newsletter (above) to receive all the latest facts direct to your email!